How much does a Curb ride cost? Estimate the price of your Curb before you go! Curb connects you directly to thousands of taxis in cities like NYC, Chicago, and Miami. Curb is the official taxi app, that enables you to electronically hail safe and licensed taxicabs to your location. Supported cities are New York City, Chicago, Miami, Washington DC, San Francisco, Boston, Baltimore, Pittsburgh, and more. Learn how much Curb costs in over 60 U.S. cities and plan for future travel! CURB, formerly Taxi Magic, is an on-demand car service that hails an existing traditional taxi through the CURB smartphone app. Unlike other rideshare companies, such as Uber and Lyft, which hail a peer-driven car, the CURB app will hail a traditional licensed taxi or professional for hire car. Their local partners (taxi companies and private for hire cars) set the fares, so prices will vary depending on location. Curb does add a $2 fee to each ride for using their app. The app allows you to either pay via credit card or cash. One differentiating factor with the CURB app is that it is also tailored for taxi dispatchers. With CURB, dispatchers will continuously be supplied with significant data regarding where their fleet is and how many fares their cars have picked up. CURB is currently only available in the United States but they do operate in over 60 cities! What cities does Curb support? 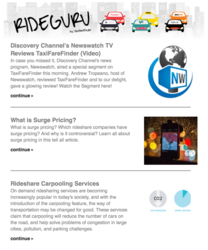 What rideshare services does Curb offer? This is Didi Chuxing’s budget option. When you select a standard car, an everyday car with seating for up to 4 people will arrive to pick you up. This is Didi Chuxing’s option for large groups of people who want to travel together. While a standard car can only seat up to 4 people, a 6-Passenger Van will have seating for up to 6 people. This is Didi Chuxing’s luxury option. When you select a premium car, a high-end sedan with seating for up to 4 people will arrive to pick you up. While you will ride in style, the price for a premium car is significantly higher than a standard car. This is Didi Chuxing’s newest and cheapest option. The prices for an economics car are even lower than a standard car. This service is currently only available in a few cities. When you select an economics car, an everyday car with seating for up to 4 people will arrive to pick you up. CurbFareFinder is not affiliated with Curb®. If you have any questions, please contact us.